In the last 9 months, the capsuleers of New Eden have worked together to defeat Omir Sarikusa, supported Mordu's Legion against Serpentis pirates, helped the Upwell Consortium build Citadels, and provided critical aid to Valkyrie efforts to take down the Guristas. It's been an exciting time and for those of you who have loved participating in these events and shaping the story of New Eden, there is more to come! 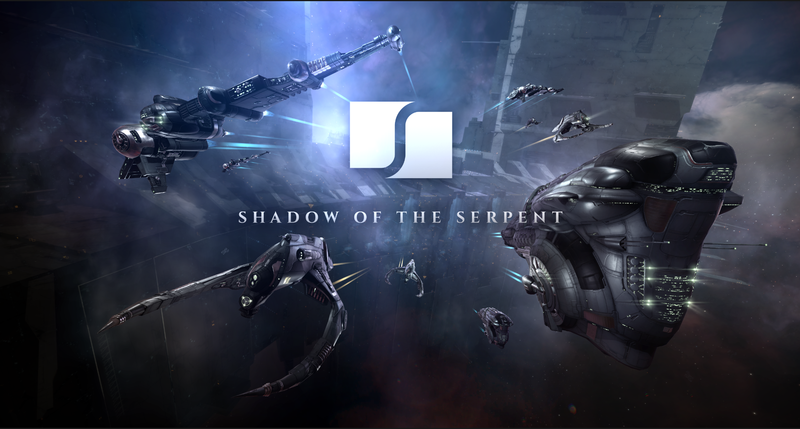 In the June 28th EVE Online release, the Serpentis are resurgent in a new event (with a twist): Shadow of the Serpent. The Shadow of the Serpent earns its name from the hidden Serpentis arms race we will see happening over the next few weeks. Naturally, many organizations within New Eden are pretty unhappy with the Serpentis creating new, advanced tech with an intention to distribute and will do anything to put a stop to this and they want your help! 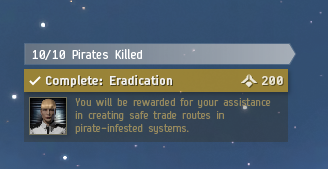 With so much happening in New Eden lately, the major corporations and factions are overwhelmed with work and will reach out to the newly independent Scope Network for help. The Scope Network will use this opportunity to start up a new business venture, as a broker service between the major organizations of New Eden and the real powerhouse; the capsuleers! To help the Scope Network succeed in this venture, we have been working on a prototype framework for a new way to display events happening in-game. The available activities displayed on this prototype are not Shadow of the Serpent challenges and are just for testing purposes, but it will still give a good idea of the look and feel of the new events UI. 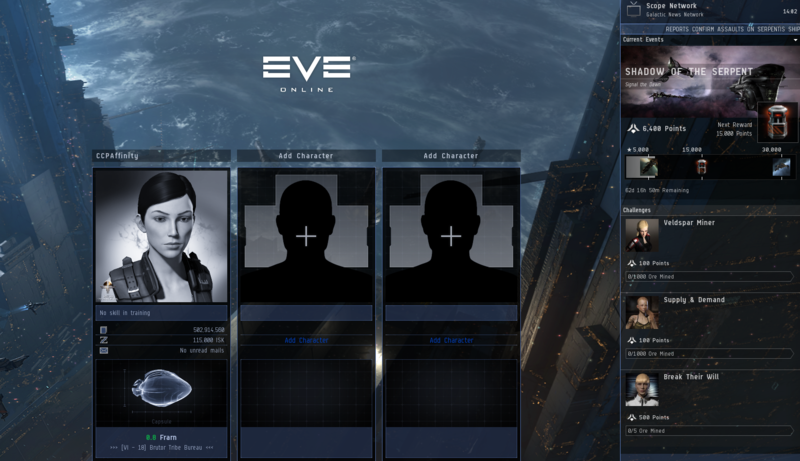 When an event is happening, you will be able to see event specific challenges in your character selection screen. These will also appear in the new Scope Network window in-game, which you can access via the Neocom. Over the course of the event, which will run for 6 weeks, you will notice a much wider variety of available challenges including roaming Serpentis and Angel Cartel pirates and 9 new event themed sites complete with loot and bounties. On top of that, each time you complete a challenge listed on your Scope Network window you will earn points towards small, medium and large Scope Network prize containers. These containers will contain some very nice rewards, a selection of which will be available for the first time during Shadow of the Serpent. 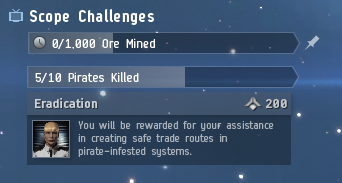 When the June release goes out you can log in and check out the available challenges in the Scope Network window. The Scope Network will offer you several optional challenges that they are distributing to capsuleers - if you complete them they will offer you new challenges, and if you leave them be they will expire after 3 days. As you complete challenges, you will see your points total increasing and how many remain until you unlock the next reward. Your progress on challenges will be logged so you can take a break whenever you like and pick up again when you return. For the Shadow of the Serpent we will also have special rewards for the capsuleers with the most points earned during the event! Remember, the challenges in the images are just prototypes - we don't want to spoil the surprise! We are excited to see how the Shadow of the Serpent goes and will be eagerly awaiting your feedback so we can work with the Scope Network to try new things for the future! Good luck capsuleers! We are looking forward to hearing your thoughts on the Shadow of the Serpent event coming to New Eden on June 28th and your ideas for future events! “When we reveal these designs to the cluster it will force them to listen. They’ll have no choice. It’s only then that the Federation will realize that their overconfidence and carelessness with the Molyneux was the catalyst that created the monster they now have to face.